Raised in Hastings, Dr. Jim graduated Hastings High School. Then he entered the University of Michigan as a Regent's Alumni Scholar. While at the University of Michigan, Jim was twice named a James B. Angell Scholar. He received his B.S. with high distinction in Anthropology-Zoology in 1981. That fall Dr. Jim started his training at the University of Michigan School of Dentistry, and received his DDS degree in 1985. During his time at the School of Dentistry, Jim received the Donald A. Kerr award as the outstanding student in general and oral pathology and the American Academy of Dental Radiography award as the outstanding student in dental radiography. He was inducted into the Omicron Kappa Upsilon national dental honor society. Dr. Jim's student research was published in the journal, Anesthesia Progress and he was honored to present his results at the 1985 meeting of the International Association of Dental Research in Dallas Texas. 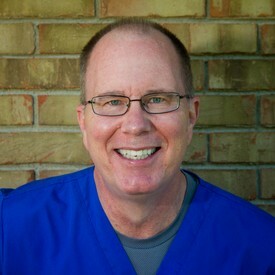 After dental school, Dr. Jim elected to do a one year General Practice Residency at the University of Illinois Hospital. His residency experience included a course in physical diagnosis through the University of Illinois medical school, a rotation on an internal medicine service (at the West Side VA Hospital), and a rotation on an anesthesia service doing IV sedation and general anesthesia for surgeries. It also included rotations in oral surgery and hospital dentistry, working primarily on medically compromised patients and Medicaid eligible children. Dr. Jim returned to Hastings in 1986 to join his father, Dr. Carl Peurach, in private practice. Jim partnered with his father until Dr. Carl's retirement in 1995. Since 1996, Dr. Jim has partnered with Dr. Angie and a dedicated support staff. Over the years Jim has had over 600 hours of continuing education on such subjects as obstructive sleep apnea, dental implants, porcelain veneers, cosmetic bonding, all ceramic cosmetic restorations, chronic pain and many others. Dr. Jim is a member of the American Dental Association, the Michigan Dental Association and the West Michigan District Dental Association. Dr. Jim married his high school sweetheart Peggy in 1982. They have three sons: Stephen, Jonathan and Thomas. Jim enjoys golf, tennis and outdoor recreation. He has been a parent coach for over 30 youth soccer, basketball and baseball teams. 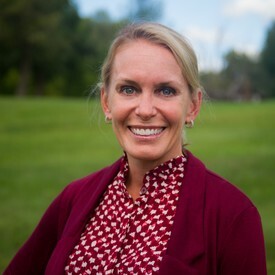 Dr. Angie Vredenburg attended Michigan State University from 1988-1992, where she was selected for enrollment in the Lyman Briggs School for accelerated sciences. Dr. Angie graduated with a Bachelors of Arts degree in Audiology and Speech Pathology, and was accepted into both dental school and graduate studies in speech pathology. Dr. Angie decided to pursue a career in dentistry because she could combine her love for all sciences with her desire to work intimately with people in the medical field. Dr. Angie then attended the University of Detroit Mercy School of Dentistry from 1992-1996. After completing her D.D.S. degree, she joined the practice of Dr. James Peurach in July of 1996. She enjoys working in Hastings, as it is very similar to the town she grew up in, Ortonville, Michigan. Dr. Angie has participated in over 450 hours of continuing education in dental studies, including a mini residency with the Synergy Training Program for dental implants. Dr. Angie enjoys all aspects of general dentistry but thrives on the relationships with her patients of all ages. She is a member of the American Dental Association, the Michigan Dental Association, and the West Michigan District Dental Society. Angie is happily married to her husband, Marty and they have 3 sons. She stays active volunteering at her children's schools and with her church. When she finds free time she enjoys gardening, reading, running, yoga and cooking.